Inspiration is really quite magical. 1. small agenda, but NO schedule. it was so fun to check out the shops in the little casual beachy towns, like balboa and hunington… then the contrast and similarities in the ritzy, glam shops of Santa Barbara ands Carmel. We totally lucked out with our accommodations. We got to each of our overnight spots around midnight, so it was fun to wake up and see what it looked like! ~ so totally beautiful along the California coast. Carmel was my favorite. It’s so totally amazing. We took Capri along, and she was an absolute angel. I wound up LOVING the metrowrap, for carrying Capri- and she loved it too. I think we only got one photo of all 5 of us. Me, em, liz and janet. Janet Hopkins just came on board as our education coordinator. She is so awesome-and I am thrilled to have her insight and help. She has done a lot of teaching, designing classes, scrapbooking and is totally so organized and on top of things. The more people like that, that are surrounding me THE BETTER. Thanks for coming Janet… and of course, I appreciate all the em does for me, and for the brand. No one works like she does. And lastly, despite the fact that liz no longer works for the brand, it was great having her on board for the inspiration trip- I enjoy her insights and her thoughts. And having the little angle Capri along- she was her own kind of inspiration! She is very inspiring. As are all my children. You know, it’s good to go away, just long enough to miss them. And for them to miss me. –so my last thanks goes to Eric, for understanding how much I need that. Escaping reality just enough to in fact, be inspired. He is a key part of my ‘team’. this is my first-ever attempt at creating a photo collage in photo shop. for whatever reason, i am completely intimidated by photoshop... so don't judge me too harshly, i was in a race against the lap top battery (em i need that cord back!) but, i have all these cutie photos that i thought woudl be fun to share...dang... that was a great trip! Great collage, great photos! Looks like you had a good time! That pizza looks yummy! Glad to hear you are indeed inspired. great pics - i love the font on the collage - what is it? looks like capri is very happy and laid back!! Sounds like you had a wonderful time! Capri looks so adorable "wrapped" up. I love your collage ~ that's next on my list to learn... I have to admit, the pizza looks absolutely yummy ~ and YES, I am hungry! Can't wait to see what you have up your sleeves! As always, it'll be fantastic! Sounds like an amazing time, Heidi! So glad you were able to get away and find the inspiration you were looking for. Can't wait to see what awesome new products/ideas you churn out next! You are AMAZING! (And ya know, you LOOK amazing, too! No one would ever know that you just had a baby. And she is an absolute doll!) Blessings to you! So are their roses in our future ? Love the collage, tried it for the first time a few weeks ago myself. Looks like you had such a fun trip!!! Love the photo collage (a great, easy way to share all those photos!) and I love little Capri in her sling! it is such a wonderful feeling to be totally inspired! you do that for sooo many-thank you! can't wait for your "big picture!" oh heidi, when i heard you talk about these trips during your scrapetc class in birmingham i thought they sounded fantastic. but now, with photos, gah! even more than fantastic. i think i need to remember to give myself some inspiration trips -- even if it's just a half hour in a new store in town. thanks for sharing. Looks like a wonderful adventure! Can't wait to see what's in store! PS. Could you tell me who makes the Metrowrap....it looks sooo comfy, and would love to try it out! TIA! Love the sharing that you do with all of us. Can anyone please tell me what version of photoshop will allow me to do a collage? Inspired, but not sure where to turn to/ Have the basic version, obviously need to upgrade. Thanks for the help. check out that awesome wrap! Looks like fun! Love this collage, and that baby is just adorable! It looks like you enjoy using the Metro Wrap, and Capri looks so snug and safe. Do you prefer that over a Baby Bjorn type carrier? Looks like you had a great trip! Can't wait to see what inspiration you will share with everyone! i love that you can recognize what inspires you...i have to admit, i do the same thing. i live near to seattle, so if i am feeling blah (whether its physically, emotionally or creatively...)i take a little trip to a few different districts and just let inspiration abound. i am sure you gals had a fabulous time. those pictures are so wonderful, such sweet happy smiles. can't wait to see whats new. you never disappoint! What a fun trip...I think all women need to do this kind of trip with girlfriends...just for a refresher in life. what awesome pictures!! i can't wait to see what you have in store...capri looks so cute in your wrap!! 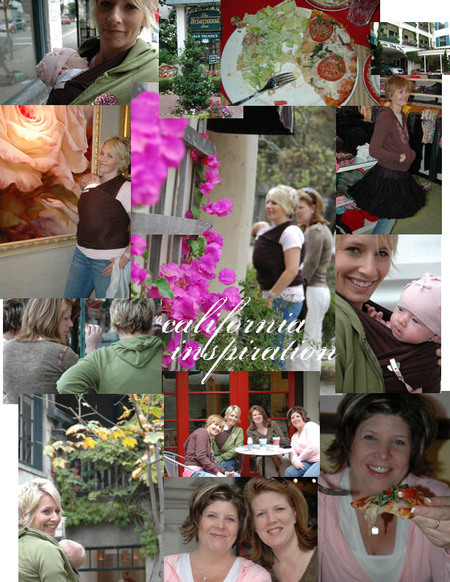 Fantastic photo collage--love all the flowers in bloom and you look great wrapped up with Capri. Count your blessings for a supportive husband...mine doesn't like it when I go away, esp. if I spend money. One CKU I ate canned spam and crackers to save money. Yuck, have you ever tried that stuff? You have the best job in the world and so does Em and Liz. Can't wait to see what you've come up with for new products! From all of us scrappers, Thank You for taking the trip. Heidi, I went straight to the photo and just by looking at the pics I KNEW where you were! HA! That is how much I love that area....CARMEL.....Monterey.........ahhhhhhhhhh the life!! I can't wait to see your BPS class description! what a wonderful collage. love all the color. great photos. welcome to janet. i know she will do fine with all the creative talent already existing. can't wait to see what is in store for us.